"Painters sometimes are like soap opera writers, they search for themes that can impact the world and little thought is given to painting as such". With his modest themes such as insects, fruit, vegetables, minerals and animals, Luis García Guerrero shows from an early age a great interest for painting. Born in 1921 in the city of Guanajuato, Mexico, he discovers and admires the work of a fellow Guanajuatense, Hermenegildo Bustos and falls in love with popular retablos before setting foot in Mexico City in 1936. "I wasn't a very bright kid or anything. I always wanted to be a painter and I think that it's my stubbornness that has me in this line of work". He attended the Academia San Carlos, La Esmeralda and the Taller de Técnicas Pictóricas at the Instituto Politécnico Nacional with José Gutiérrez as his tutor. He became great fan for the zoology and botanical images made in the 19th Century by Alfredo Duges. During the 50's García Guerrero worked on still lives, landscapes and some "weird and extemporaneous abstractions inside the composition of his work" according to art critic Marta Traba. A decade later his work is consolidated by his simple realism and poetry characterized by his own style. Marta Traba writes, "Garcia Guerrero faithfully believes in the properties of the things he paints and in the possibility that if closely examined those properties and their translation to the canvas constitute the reasons of beauty". 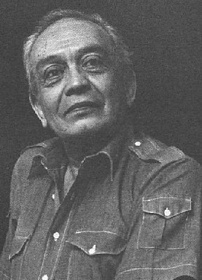 During his career he also made many illustrations that are published in magazines and periodicals like Umbral, Garabato and Colmena Universitaria in Guanajuato. Between 1953 and 1956 he was commissioned the stained glass windows for the chapel of the Leprosario de Zoquiapan and also makes prints with A. Vlady and Mario Reyes. His work has been exhibited by the most important galleries and museums in Mexico such as the Galeria de Arte Mexicano and the Museo de Arte Moderno in Mexico City. His name has also been a part of collectives throughout Mexico and the rest of the world. This noted artist stopped working during the early 90's due to problems with diabetes and settled in Mexico City where he ultimately died on December 16, 1996.